On Wednesday ZSP was back at the Manpower headquarters in Warsaw trying to make headway with the claims. The management is stubborn and does not want to make payments for planned working time when the employees did not get any work, although workers received payments from other companies from between 12-21 days. Manpower was claiming that this work was not scheduled, but we brought them new documents that makes this more difficult to deny. They said that they would take 14 days to decide. We'll be back at Manpower to let them know they cannot just keep putting people off. The workers at Amazon are not yuppies who can afford to wait for months for their pay while corporate executives think of ways to avoid paying. The comrades of NSF in Norway also handed out leaflets in support of the Amazon workers in Oslo, where workers were on a general strike. On Thursday, the Solidarity Federation participated in a communications blockade of two offices, calling and sending emails in support of the workers. Priama akcia visited the Slovak headquarters of Amazon on the same day. They went at lunch hour, which was good because a lot of the Amazon employees were going in and out of the building. 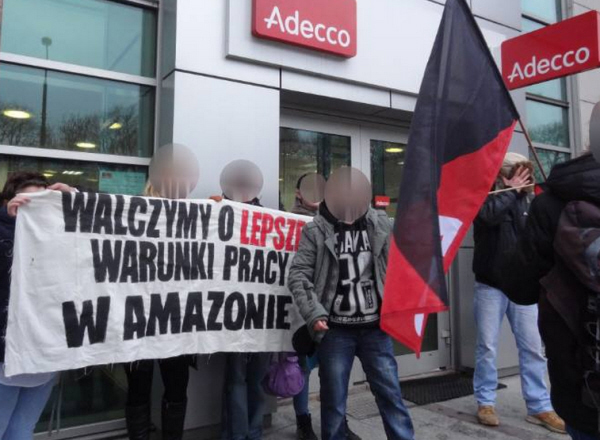 Many stopped and spoke with the comrades and there were feelings of solidarity expressed towards the workers at the Polish fulfillment centers. The comrades from Solis and MSS visited a Manpower office in Prague, Czech Republic on the same day. 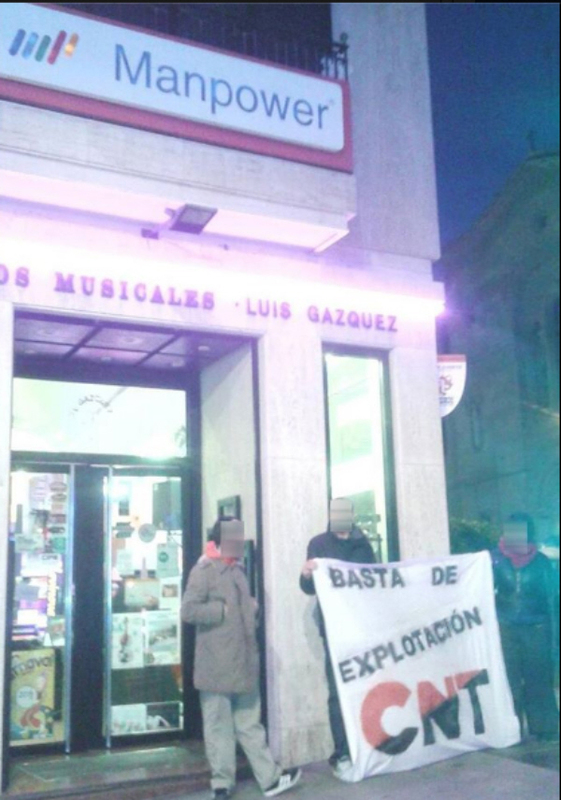 In Spain, another Manpower offices were picketed by the comrades of CNT in Almeria. 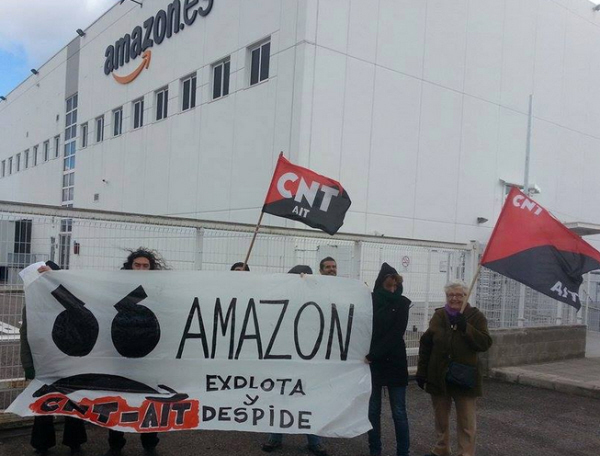 On Saturday, comrades from the CNT-AIT went to the Amazon center in an industrial area in Madrid. They picketed in front of the gates, handed out leaflets and expressed their support for the struggle. 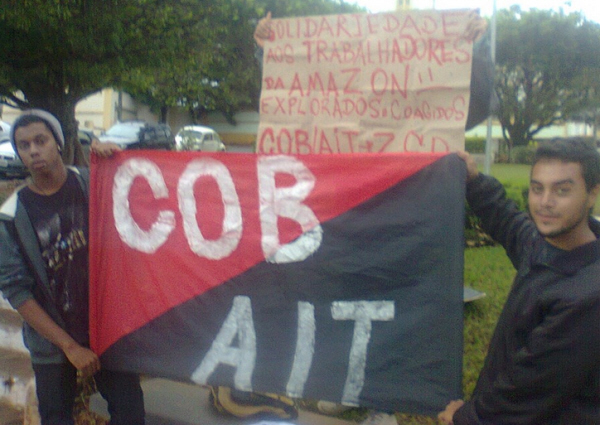 In Brazil, the comrades of COB went to the streets and informed people of the struggle in Amazon Poland. In Croatia, the comrades from MASA went to the Manpower office and informed about the situation of the workers. Besides the possible future actions, there was also a solidarity action some time before this week. On January 16, the comrades from the IWW in Milwaukee went to Manpower Corporate Headquarters in the US. There they spoke to a representative of the HR department and forwarded the workers' demands. Despite the outstanding issues with Manpower and Amazon, as of publication over 30 workers have received all sorts of payments for different things. Many received payments for breaks in the work schedule, from 12-21 days' pay. Overdue salaries were paid, statutory interest for late payments, money for laundry/uniform equivalent, money for sick days that the company did not want to recognize, money for time at training sessions, some overtime payments, some payments for incorrect calculation of wages, some money for unused vacation days, etc. etc. For some people this equalled even one month's salary. Another thing is that we found out that many workers have a paid break, although some did not, or at least were not allowed to use it. This matter should be straightened out now. The fact is that the agencies and Amazon will not check to see if everybody was paid correctly. If a worker does not specifically address the employer and say „my pay was short”, they will not investigate the claim. We think they should be checking for discrepancies for everyone. But they won't do it. Only those who fight will win. The working conditions still leave a lot to be desired. We had reports of industrial accidents and one report that a work-related accident was covered up because the woman was forced to move too heavy weights. There are still many health and safety issues. There is also a problem with getting to the cafeteria in time to have lunch. Lunch breaks are only 30 minutes and workers find it impossible to walk to the cafeteria and eat something and get back in time. We have seen that Amazon counts every minute late and makes deductions for employees even spending a few seconds too long in the toilet. Another thing is that we have heard about workers getting fired without notice, for unknown reasons. These workers are probably also entitled to pay for the notice period they were not given. There were also questions about lack of health insurance. Last but not least, the workers in Bielany Wroclawskie still have a basic salary which is lower than in Sady for doing the same work.